Well last week I couldn’t take it any more. 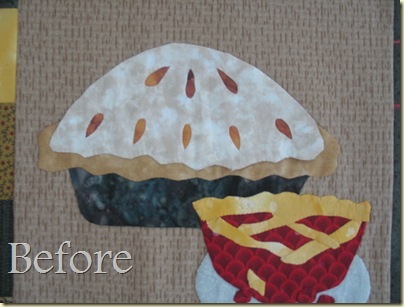 I broke down and redid the apple pie. How often do you let yourself go back and redo part of a quilt? You’re right! The warmer tones made a big difference. The agter picture is most pleasing to the eye (and stomach). It is much better, and I bet it wasn’t really that time consuming once you committed to it. Or was it? 🙂 I redo things fairly often if they bother me; I’ve found it’s better to do it than to regret it forever. Since I agonize enough for 3 people when I finally do commit to fabric, I am pretty sure it is what I want. I have been doing paper mockups lately and that has been helpful.I wonder (a little too late) if you could have teadyed the crust enough on the white fabric to get the baked look. Definitely an improvement with the baked look. Honey, everything you do looks fabulous. Your talent is amazing. 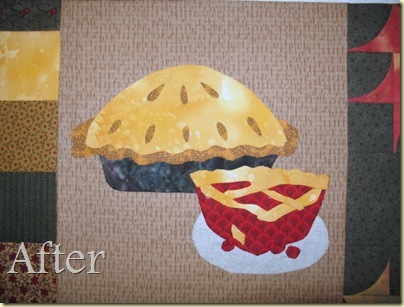 This quilt is going to be so sweet when you finish it.mmmmmmmmm…pie!